There's a new article about the biblical Goliath and the etymology of his name. Was he a Carian? We've got a new, very useful tool available that will help you with the basic sound correspondences between major Indo-European groups. We're working on some new dictionaries, specifically cuneiform Luwian, Hittite and Ancient Macedonian. That's a bold title isn't it? It doesn't matter. 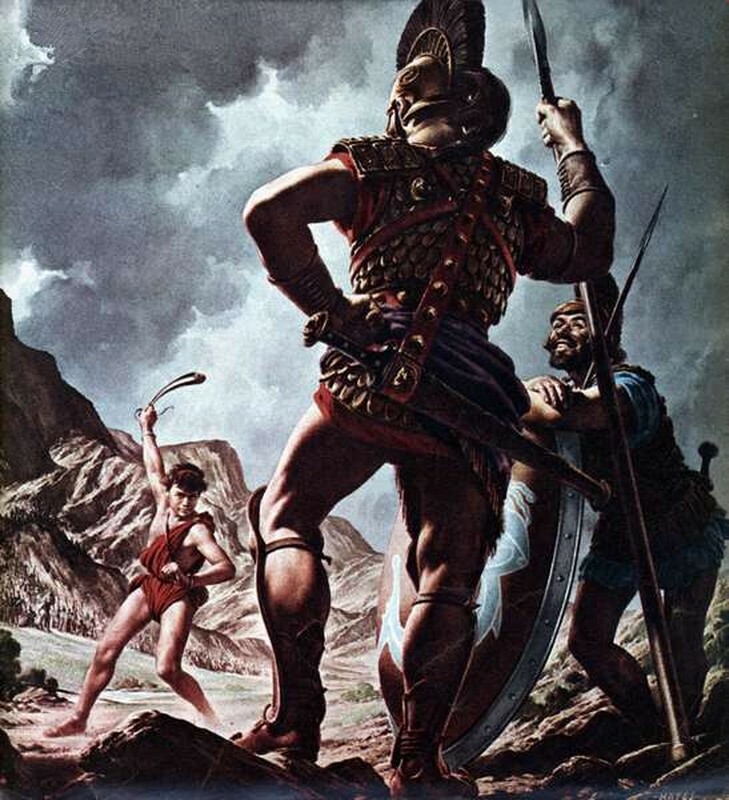 Let's start with the basics: Who was Goliath? Don't take it for granted that everyone knows. και συνάγουσιν οι αλλόφυλοι τας παρεμβολάς αυτών εις πόλεμον και συνάγονται εις Σοχώ της Ιουδαίας και παρεμβάλλουσιν αναμέσον Σοχώ και αναμέσον Αζηκά εν Αφεσδομίν και Σαούλ και οι άνδρες Ισραήλ συνάγονται και παρεμβάλλουσιν εν τη κοιλάδι της τερεβίνθου ούτοι και ούτοι και παρατάσσονται εις πόλεμον εξεναντίας των αλλοφύλων και αλλόφυλοι ίστανται επί του όρους ενταύθα και Ισραήλ ίσταται επί του όρους ενταύθα και ο αυλών αναμέσον αυτών και εξήλθεν ανήρ δυνατός εκ της παρατάξεως των αλλοφύλων Γολιάθ ην όνομα αυτώ εκ Γεθ ύψος αυτού τεσσάρων πηχέων και σπιθαμής και περικεφαλαία χαλκή επί της κεφαλής αυτού και θώρακα αλυσιδωτόν αυτός ενδεδυκώς και ο σταθμός του θώρακος αυτού πέντε χιλιάδες σίκλων χαλκού και σιδήρου και αι κνημίδες αυτού χαλκαί επί των σκελών αυτού και ασπίς χαλκή αναμέσον των ώμων αυτού και ο κοντός του δόρατος αυτού ωσεί μεσάντιον υφαινόντων και η λόγχη αυτού εξακοσίων σίκλων σιδήρου και ο αίρων τα όπλα αυτού προεπορεύετο αυτού και έστη και ανεβόησεν εις την παράταξιν Ισραήλ και είπεν αυτοίς ινατί εκπορεύεσθε παρατάξασθαι εις πόλεμον εξεναντίας ημών ουκ εγώ ειμι αλλοφύλος και υμείς Εβραίοι του Σαούλ εκλέξασθε εαυτοίς άνδρα και καταβήτω προς με και εάν δυνηθή πολεμήσαι μετ΄ εμού και πατάξη με και εσόμεθα υμίν εις δούλους εάν δε εγώ καταδυναστεύσω αυτού και πατάξω αυτόν έσεσθε ημίν εις δούλους και δουλεύσετε ημίν και είπεν ο αλλόφυλος ιδού εγώ ωνείδισα την παράταξιν Ισραήλ σήμερον εν τη ημέρα ταύτη δότε μοι άνδρα και μονομαχήσομεν αμφότεροι και ήκουσε Σαούλ και πας Ισραήλ τα ρήματα του αλλοφύλου ταύτα και εξέστησαν και εφοβήθησαν σφόδρα. The foreigners (Philistines) gathered their army for battle. They collected at Socho in Judea. They piched camp at Aphes Dammin, between Sokoh and Azekah. Saul and the men of Israel gathered and camped in the valley of Terebinthos and drew up their battle line to meet the foreigners (Philistines). The foreigners (Philistines) occupied one hill and the Israelites another, with the canyon between them. Then a strong man came out of the camp of the foreigners (Philistines), named Goliath, of Gath. 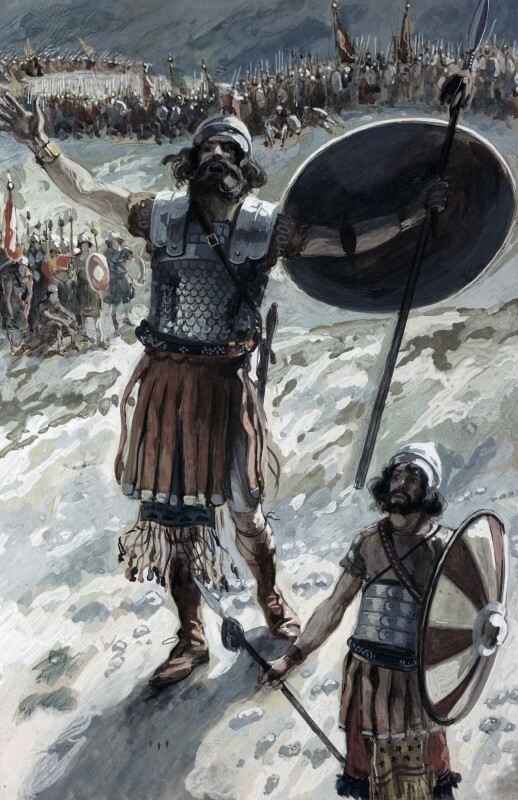 Goliath was enormous in size, over three meters (nine feet) tall, and wore a bronze helmet and a coat of scale armour of bronze and iron weighing 60 kg (132 lbs). On his legs he wore bronze greaves and between his shoulders a bronze javelin. His spear shaft was like a weaver’s rod, and its iron point weighed 7 kg (15 lbs). His shield bearer went ahead of him. Goliath shouted to the Israelite battle lines “Why do you come out and line up for battle? Am I not a foreigner (Philistine) and are you not the Hebrews of Saul? Choose yourselves a man and have him come down to me. If he is able to fight and kill me, we will become your subjects; but if I overcome him and kill him, you will become our subjects and serve us”. Then the Philistine said, “This day I defy the armies of Israel! Give me a man and let us fight each other.” When Saul and his Israelites heard this they were dismayed and terrified. Does this sound familiar so far? If not then lets make a long story short... David from the Israelite side accepted the challenge and killed the enormous Goliath with a single sling shot. The point of this article though is not to narrate you a story with a happy ending. David is not our man in this case. Goliath is. He bears a name that is definitely not Semitic. The Philistines, his people, are believed to belong to the so called “sea people”. The sea people are believed to have come from the Aegean region, but their ethnicity is a matter of discussion. Most probably, they consisted of a number of ethnic groups. Goliath might have belonged to one of them. 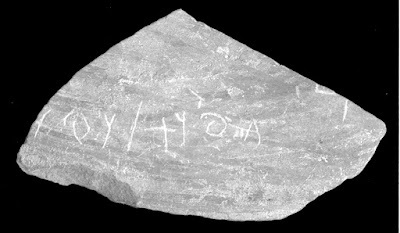 Few years ago, a late Iron Age I/early Iron Age II Old Canaanite inscription was found in Tell es-Safi/Gath (where Goliath came from). The inscription derives from a clear archaeological context and is written on a fragment of a chronologically indicative, red-slipped and hand-burnished ceramic bowl. The inscription contains two personal names ʾalwt and wlt. Those names were reminiscent of Lydian names such as Alyattes as well as Hittite names ending in -wattas, although objections were raised in regard to the phonology. 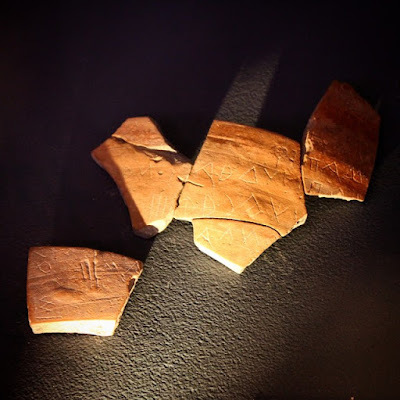 Few years after the discovery of the Gath ostracon, some Carian inscriptions from Thessaloniki, Greece came into light. In one of them the name wljat appears. This name has a perfect match with the Carian names rendered in Greek Ολιατος / Υλιατος. So we have Carian wjliat and Canaanite wlt. That's a good match, but it is still not Goliath. How does the initial /g/ (gimel) in Hebrew explain its presence? Ancient Hebrew does have a /w/, but one does not find words beginning with /w/, because proto-Semitic *w became *j in this language. Therefore, a substitution of the Carian /w/ with a gimel is fully possible. Such a substitution is far from unique e.g. English William → French Guillaume. There you go... The non-Semitic name Goliath, was most probably a Carian name. That of course doesn't make all the Philistines Carians. Carians used to fight for foreign powers as mercenaries e.g. in Egypt. The person who inscribed the name 'wlt' was apparently not the mythical Goliath, but most probably a Carian soldier spending some time inscribing his name on ceramics. Regarding the etymology of the name W(u)ljat / W(o)ljat, it probably comes from a PIE verbal root which means ‘to be strong’ (*ṷelH-) and in this sense would fit very well with the strength of the giant who is described in the Greek text of Samuel as ανήρ δυνατός 'strong man'.